energy. It can warm up us in cold day. Yang deficiency people are always afraid of cold. They can promote Yang Qi by drinking medicinal mutton soup. 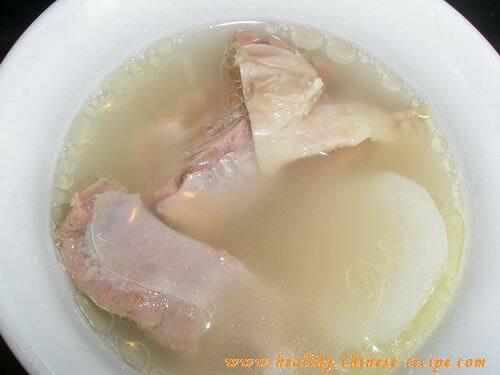 For ordinary people, you can prepare mutton white radish soup. Radish helps to remove unpleasant smell and promote metabolism. b. Some nutritious material in the bones will penetrate to the soup after long time cooking. So lamb chop soup is more delicious and nutritious than that of pure meat soup. 1. Wash lamp chop, cut into bite size. 2. Put lamp chops in a wok, add cold water and cover. Bring to a boil. Throw away the soup. It's dirty. 3. Refill water, cover and higher 4 inches above of the mutton. 4. Add radish, ginger and shallot. Bring to a boil. Turn to low heat. Simmer for 90 to 120mins. 5. Add salt for taste. Boiling for additional 10 minutes. 6. Turn off heat. Remove the surface oil. Serve warm. Tip: If there are too much oil on the surface, you'd better cool the soup. The oil will be solidified if it's cold enough. Take out these oil blocks. Heat again. Serve warm. small bowl (a cup) each time. soup in winter. Those who always feel hot don't drink mutton soup. Here is some advices and tips for eating mutton. 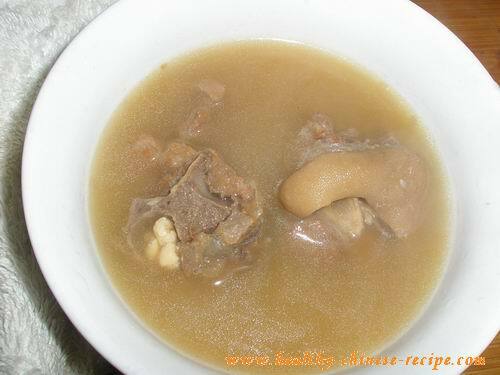 Below is Medicinal mutton soup. It is a prescription recorded in an Ancient Chinese medical book "Qian Jin Yao Fang". It was used for women whose abdomen were cold-pain after baby delivery. Now it's widely used in treating diseases caused by coldness. Here is the reference symptoms and diseases. 1. Soak Angelica and ginger in cold water for 15 minutes. 3. Add mutton,Angelica, and ginger in a pot. Serving Method: Serve 200ml one time, including meat. 3 times a day.